Registration for the 2019 Ten Mile Relay will open on July 1, 2019. Thank you for a fantastic 2018 event! We had a record number of participants from all over the country, and expect to at least match last year’s charitable contribution of $25,000! Please contact us if you have questions or more photos to share. Make sure to tag your race day pictures with #LJ10MILERELAY, and check out our instagram for event updates, details, and more! 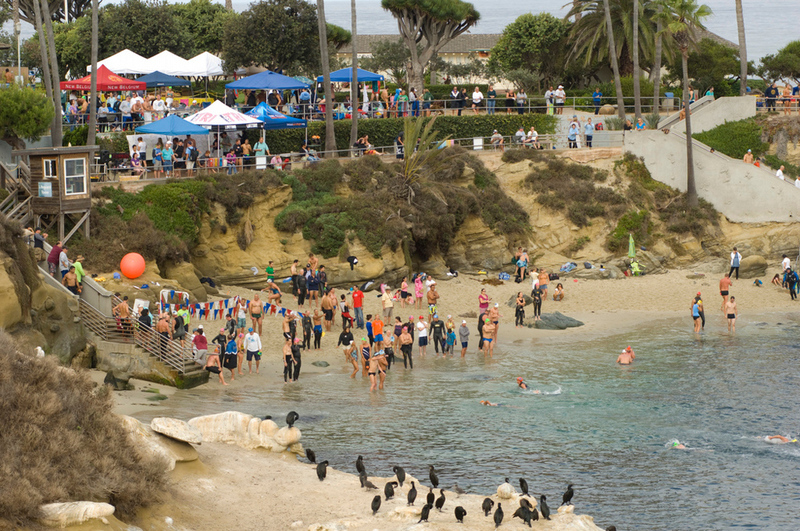 The La Jolla Cove 10 Mile Relay is one of the most anticipated and enjoyable open water swim events of the year. Organize a team of up to 5 swimmers (or swim it solo), give your team a cool name and enjoy the camaraderie of fellow swimmers and the spirit of swimming with this unique event and charity fundraiser. More details: This is a 10 mile relay swim race (or for the solo swimmers, simply a 10 mile swim). Teams of up to 5 swimmers will swim a total of 10 miles, presumably 2 miles each. Teams with fewer than 5 swimmers must also complete the full 10 miles. Swimmers must swim at least 1 mile before being relieved by the next swimmer at the water's edge. Any swimmer may swim 2 or more miles for their team. Teams may divide up the laps and the order of the swim any way they wish. Two swimmers from the same team cannot swim at the same time and count that as multiple laps. The hand-off between team members is via a hand-slap. The start time of the next swimmer is the same as the finish time of the previous swimmer. The finishing lap swimmer is responsible for communication of start and finish of the lap. Timekeepers will record lap times for each swimmer and team. Information will be posted on the wall behind the lifeguard station. The course is a triangular ~1 mile lap around marked buoys. Swimmers may wear wetsuits, fins, masks, and snorkels, but will only be considered for the combined age category team awards and not eligible for Top Male, Top Female, or Solo Team category awards. For teams with less than 5 members, the total combined age category will be the average age of your members times 5. Parking is free on the surrounding streets. Please allow ample time to find a spot, as it will get crowded. Click here for a map and directions. Please note: This event is for experienced ocean swimmers who are prepared for a swim of 2 x 1 mile in open ocean, “rough water” conditions. We cannot guarantee the safety of swimmers, especially those who are unprepared. Each swimmer must present a signed Release of Liability when they check in on September 29th to be eligible to swim. Registration will re-open July 1, 2019. *Please make checks payable to "La Jolla Cove 10 Mile Relay"
The 10-Mile Relay is, at its heart, a charity fundraising event in support of Community Giving. The event staff is 100% volunteer. The costs to stage the event are kept to a minimum thanks to donations of services from a number of businesses and people. As such, we are able to apply a portion of your entry fee to the net proceeds that are donated to the charities we support each year. We are proud supporters of the American Diabetes Association and the Prevent Drowning Foundation of San Diego. While not mandatory, we would hope that you would consider making an additional contribution as part of your participation in the event and to help us provide even greater support. You may do so as part of your online registration, or at the event. 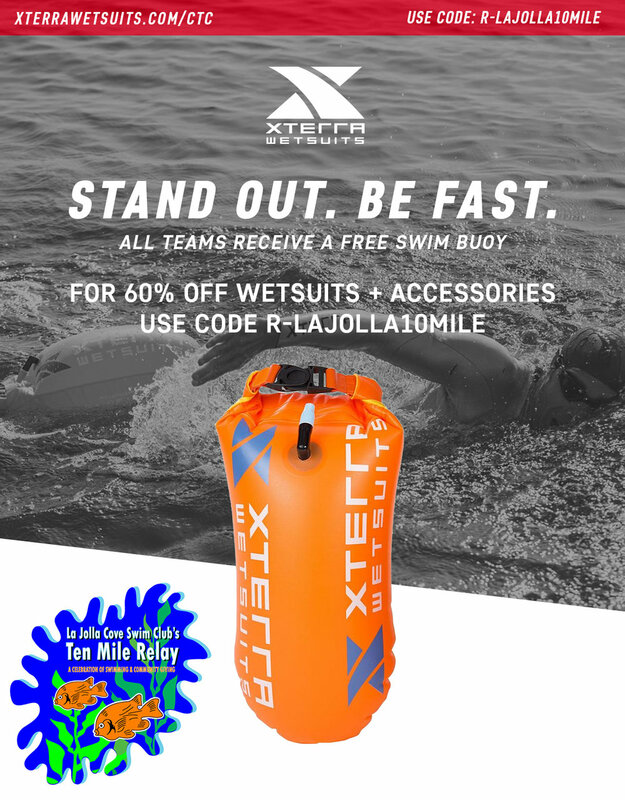 We are excited to announce Duke's La Jolla, Maxim Sports Nutrition, and XTERRA Wetsuits as the official sponsors for the 2018 La Jolla Cove 10 Mile Relay! Visit http://www.maximsportsnutrition.com and enter code LJ10MileRelay for a 30% discount on all product purchases and shipping rates. This is the best pricing nationwide! Interested in supporting the 10 Mile Relay and our designated charities? Contact us!